Google has introduced a Klingon interface for its search engine. Should intrigue all the Star Trek fans out there. Beam me up Scotty! 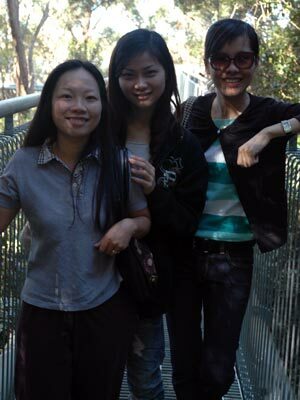 This afternoon Shao-Ping, myself and our two guests from Taiwan, Claire and Kelly, went for a drive south through the Illawarra, past my school at Albion Park and then up Macquarie Pass to the top of the Illawarra Escarpment. 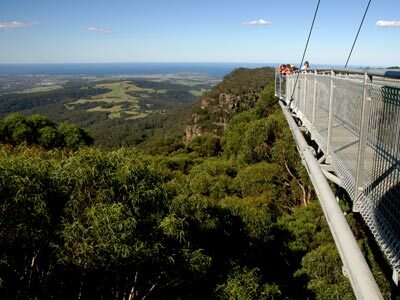 A new tourist attraction opened on the escarpment two weeks ago ~ The Illawarra Fly. What is the Illawarra Fly you ask? A large insect of the order Diptera with dimensions not unlike the Big Banana at Coffs Harbour? Perhaps a massive opened zipper comparable in size to the Big Pineapple at Nambour? Well, thank goodness, the Illawarra Fly is not a kitsch piece of titanic tourist trash. 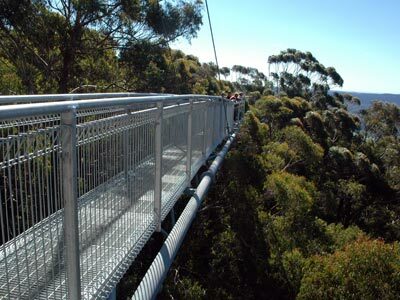 It is a tree-top walk along the edge of the Illawarra escarpment. 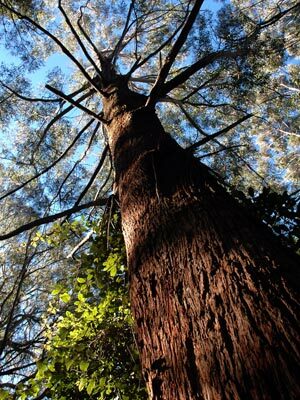 We arrived at the ‘fly‘, bought our tickets and made our way through the temperate rainforest to the structure. It is quite high and I am not one for heights actually. Not sure why. I climbed Uluru when I was 14 and I have even been on two tandem skydives from 4000 metres but some heights still get to me. I ventured out on to the structure and began taking photographs. I will admit that I did not climb the tower. Perhaps next time. 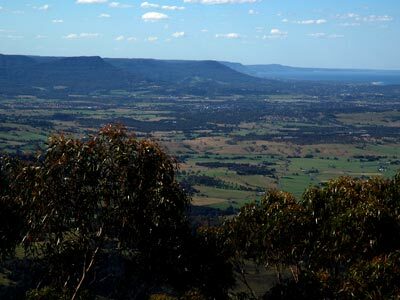 The views north and east across the Illawarra escarpment are sensational. You can see all of the peaks conquered by my alter ego Larry as a member of the Adventurers’ Club. Mount Kembla, Mount Keira and Broker’s Nose are all there. 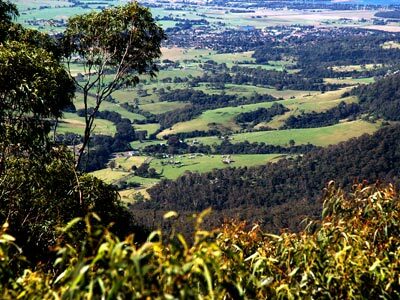 The Illawarra looks like a nice place to live and work, eh? I car-pool with Diamond and Horse from the Adventurers’ Club. Beneath us lay Albion Park and the Yellow Rock region. Due east is Shellharbour. The Pacific Ocean spreads out along the eastern horizon. The weather was perfect for the adventure. Following the tree top walk we made our way back through the forest and I took a few more photographs. I think I took 71 in all. I should create a new gallery. After that we drove back down the mountain and through the dairy farms. Claire and Kelly jumped at the opportunity to photographs the cows in the late afternoon light. 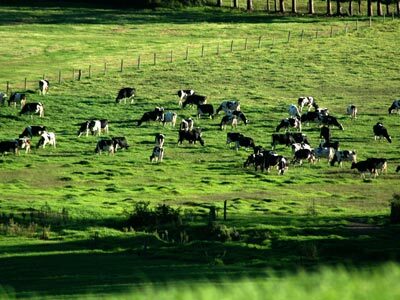 Contented cows. They’re not thinking about joining a Diigo group. Diigo in education ~ this is crazy man! At least two Diigo education groups have been created in the last three days. Think about it. There are many more similar groups on Diigo. Which one should I join? Should I join them all? Help!!!! This is all getting a little out of control. I feel like it is the middle ages, a convicted criminal, four horses attached to my four limbs and they are all galloping in a different direction. Should I join that Ning? Should I follow that group? What about Diigo? Yeeeaaaagggghhhhhhh!!!!!!! Time to move to another planet. At least get out and take some photographs and have a quiet beer. This morning I read an article in the Sydney Morning Herald about the world’s oldest recorded sound. 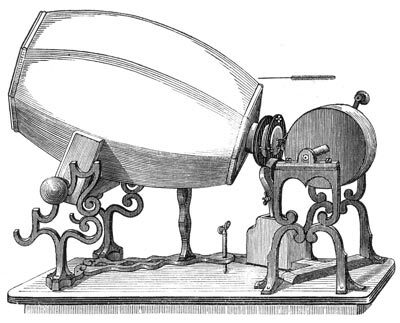 The recording was made by Édouard-Léon Scott de Martinville on a phonautograph. The audio recording predates Edison’s sound recordings by a couple of decades. The recording is available from the the First Sound site. The entire recording is ten seconds long and features a Parisian singer giving a rendition of the folk song “Au Clair de la Lune”. The recording was made on a phonautograph, a device that was created to record sounds visually. It was not designed to play them back. A group of scientists at the Lawrence Berkeley National Laboratory in Berkeley, California devised a method to decode the paper based transcription to audio. the French patent office. Image courtesy of David Giovanni and First Sounds. David Giovanni gave permission for the reproduction of the images on this page. His own web site is well worth exploring. 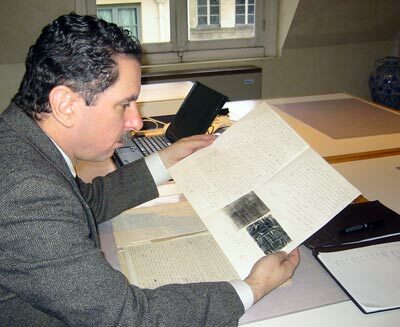 David Giovanni has been involved in the discovery and publication of old recordings. One of his releases, Lost Sounds: Blacks and the Birth of the Recording Industry, 1891-1922, even won a Grammy Award. of the Institut de France, where they were deposited in 1857. I have always had a fascination with audio. I used to enjoy taking bootleg recordings of artists like Bowie, Led Zeppelin and others and then attempting to improve the sound quality using tools like graphic equalisers and a DBX 117 dynamic range enhancer. I was once a guest editor of Crosstalk, the journal of the Australian Tape Recording Society way back in 1980, I think. Vaguely related note: If you are interested in old 78RPM records I highly recommend that you check out Joe Bussard’s Fontone Records site. He was born in 1936 and is a classic digital native. Check out his MySpace profile for his take on rap music and rock ‘n’ roll.